Hacking in a good way, to make a little app. 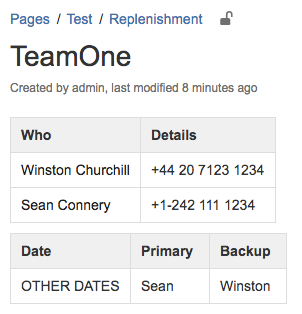 Experimenting with what an on-call app would look like inside Confluence. 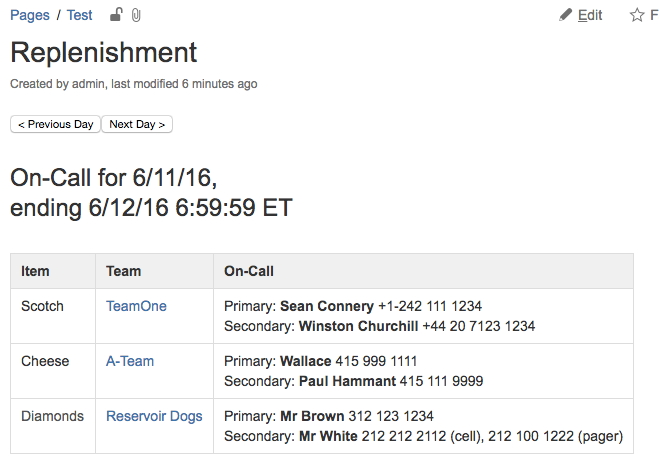 Note the three teams in the links above s: TeamOne, A-Team, and Resevior+Dogs. By the way, nobody wants to be in the b-team, team2, etc. There was a study years ago about the advantage from the lofty team name, but my google fu is letting me down. The three child pages referred to the table above. Each team gets to maintain their own small page. They could even ‘watch’ it and get email updates as it is changed. They probably would delete entries from that past, so the page stays small. // and On-call dates, the primary, and the secondary oncallee. // On-call dates, the primary, and the secondary oncallee. "Primary: <strong>" + primaryToday.who + "</strong> " + primaryToday.details + "<br/>"
I’d like to use the “Confluence content properties” from the Hosted data storage facility built in to Confluence. There’s no sample app that shows me how though. Until I see a cohesive example, I’m not going really to get it. I sure hope that, in use, it feels like a Firebase built-in to Confluence. 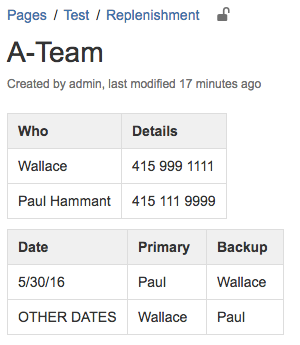 If I had that, I’d make an AngularJS mini-app that would allow confluence users to change whos on call, easily. 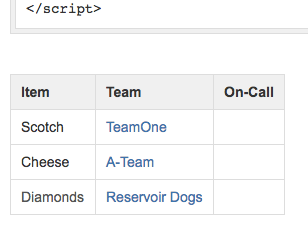 The calculator from Angular Embedded in Jekyll-Markdown Blog Entries similarly embeds quite easily in Confluence. Then again there is Anvil which has the promise of being an easy internal application development platform, and aimed at quick in-house applications like this. June 6th, 2016 - updated to include prev/next button so that preparation and communication for a weekend (etc) can happen in a single go. Teams are going to want to copy from Confluence and paste into email. Why? 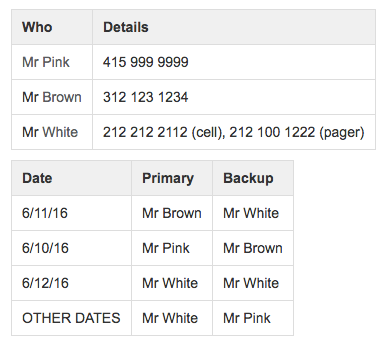 If you’re solving an incident AND confluence is down, do you want to bring back confluence first, or would you like a copy of who’s on call in email as a backup. Also useful if you’re on foot somewhere.